Conference Facilities South Africa has a comprehensive list of conference venues and centres with conference facilities in the Kalahari & Diamondfields region of the Northern Cape Province in South Africa. The Kalahari and Diamond Fields region of the Northern Cape borders Namibia, Botswana, the Free State and the North West Province. The Kalahari is situated at the far north-eastern tip of the Northern Cape province of South Africa. Kalahari is a San word meaning 'a place without water'. In the Diamond Fields region of the Northern Cape, two de Beer brothers discovered diamonds on a farm and by 1872 more than 50000 prospectors had crowded into the little shanty town that later was to become Kimberley. The Kalahari region of the Northern Cape is a boundless expanse of red earth with extreme temperatures ranging from extremely hot days to freezing cold nights. Beneath the Kalahari's red earth is a treasure of iron, manganese and other precious ores. The Kalahari is home to 40 raptor and vulture species and seven owl species. The red sands also support a vast selection of game farms which are plentiful with wildlife and hardy unusual plants. In 1866 the discovery of diamonds in the Diamond Fields region of the Northern Cape lead to the great South African diamond rush. Prospectors converged on the region with at times as many as 30 000 diggers laboring all day and far into the night. Today prospectors still sift the gravel beds of the Vaal and Orange rivers for diamonds, though their finds are now few and far between. 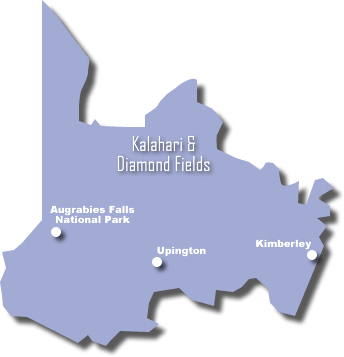 Out of the diamond rush the Northern Cape town of Kimberley was established. Kimberley is today a modern city full of interesting period houses and museums with attractions such as the Big Hole and the Kimberley Mine Museum. Upington is situated on the banks of the Orange River in the Kalahari and Diamond Fields region of the Northern Cape. Upington is ideally situated as a stopover for travelers from Johannesburg or Cape Town heading towards Namibia. To the extreme north of the region lies the vast desert wilderness of the Kgalagadi Transfrontier Park. The Kalahari region of the Northern Cape is home to the Augrabies Falls National Park. During exceptional floods the flow here can exceeds that of the Victoria Falls and is considered by many geologists to be the world's most interesting example of weathered granite. The town of Kakamas is situated just a few kilometers from the Falls and is the perfect stopover for visitors. The town has widespread irrigation schemes and boasts eleven working water wheels. Kakamas has become a major farming area and produces export quality grapes and peaches.